Newly updated to work with Moodle 2.0. Warning: there is currently no clean upgrade from Moodle 1.9 => Moodle 2.0 for this plugin, any assignments created under Moodle 1.9 will lose all coversheets and submitted files on upgrade (I will try to find a fix for this). All other features should work fully with Moodle 2.0. Students submit their work as a PDF (which can be generated from any application by using a PDF printer, such as the free PDFCreator). 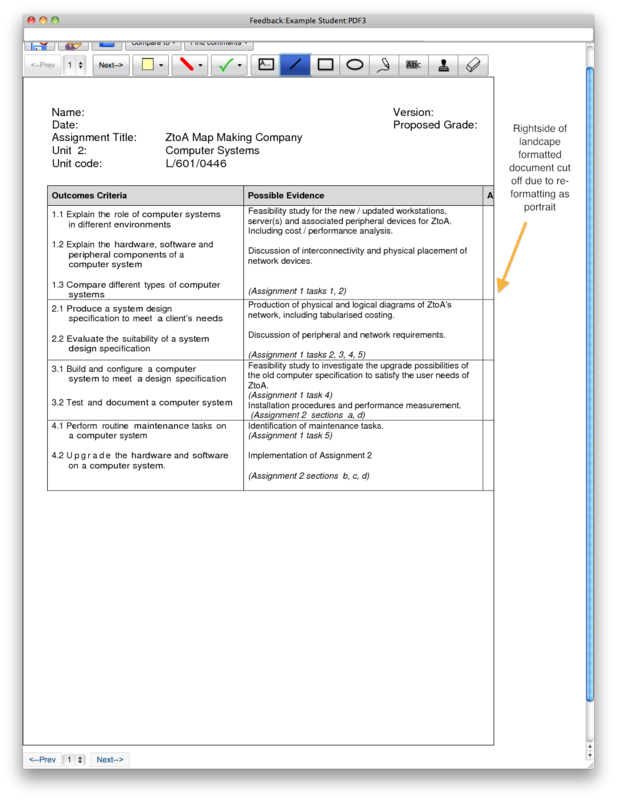 An optional coversheet is automatically attached (filled in with details gathered from the student as they submit the work). The pages of the assignment are then presented, as images, in the teacher's browser window, allowing them to add comments and line annotations to each page. Comments can be edited, moved and resized as much as you like. You can also choose from a range of tasteful background and line colours (or no background at all). Once the teacher is satisfied with their comments and annotations, their response is saved as a PDF and automatically returned to the student (along with the usual comment, grade and outcomes which are found in all assignments). Important: please make sure you read the instructions (in README.txt) carefully - you will need to install a copy of GhostScript to make this plugin work and (if you are using a Windows-based server) edit one file in this plugin to tell it where to find GhostScript. I'm afraid i haven't done much work on the 2.3 version for a while. I still hope to complete it, but I've not had much spare time to work on it. If there is anyone out there who is interested in funding the development (or grouping together with others who are interested in the upgrade), it's probably about 3 days work to get it converted (which equates to quite a lot of spare evenings) - contact Synergy Learning ( http://www.synergy-learning.com ) for a quote. Davo I am more than willing to help out with this. We have had contact from other local colleges with the same issues. Can we speak via email so I can have just a quick rundown? does this require HTML5 enabled browsers as I am stuggling with Internet Explorer 8 to get this working on client machines. No, this does not rely on HTML5 (it predates HTML5). Earlier versions of it were used successfully with IE6 (in Moodle 1.9, although I suspect it is no longer compatible with IE6), but was certainly used regularly with IE7 / IE8 over several years. I do not currently have a copy of IE8 to hand (I may still have a virtual machine with it in somewhere), but it certainly worked fine last time I tried (but something may have changed in Moodle since then). Just for information, we still have some landscape format submissions that were made under the old version of the plugin which display correctly when in annotating mode (presumably because the previous version was able to correctly handle the page formatting and rendering at the time of submission); however, when now generating a response with one of these files it then gets its right side cut off. This wasn't happening previously. I realise your development focus may have shifted to 2.3-4, etc. - but any insight you can offer would be very much appreciated. Roland - my focus has shifted to the new Moodle 2.3/2.4 versions of this plugin. However, if you drop me an email to moodle AT davosmith.co.uk and attach an example PDF that is not working correctly, then I'll see if I can investigate what is going wrong. Fantastic plugin. I have it installed and working on 2.5 beta as well. What would take this over the top would be the ability to use it on a tablet (android or iOs). Currently it appears that the default drag action moves the screen/paper around instead of drawing (based on the button that is pressed). Could/Should I add this to tracker.moodle.org as a feature request? John. I'm not going to be going any more development work on this plugin - I am focusing on the replacement linked at the top of the page. Tablet support is something I've considered, but I need to solve the problem of getting stuck in the middle of a page and not being able to scroll back up (plus I don't own a tablet to develop on). Thank you for this. Will there be a release for moodle 2.5 as well?? Andreas - please read the first line of the description on this page. I installed the plugin in Moodle 2.4 It seems that works fine if the activity only accepts a single pdf document. I have an Assignment which accepts both files and pdf files. A student is trying to upload a pdf file, but the message error says that is not a valid file. Then he uploads the same file into the regular file box and there's not an error message, the file uploads fine. Is there a restriction in the plugin? Why a pdf file can't be uploaded in the pdf plugin box, but in the regular file box? I'm not quite sure what to suggest - I've just fired up my Moodle 2.4 test site (with the latest 2.4 version of my plugins already installed), created an assignment with both file and PDF submission enabled and successfully uploaded a PDF file to both. Please be aware that the PDF is processed during submission (to add the coversheet, if applicable, and to combine together multiple files, if there is more than one PDF submitted), so the error may be related to the software being unable to read the content of the PDF. Does the error occur at the point where the file is uploaded, or at the point when the student clicks on 'Save changes'? the page doesn't shows an error message and it stays in the same page. But that pdf file 'Imagen_Mama.pdf' uploads fine in the regular file upload box. Feel free to email me on moodle@davosmith.co.uk and I will see if I can spot anything that will help.